3. 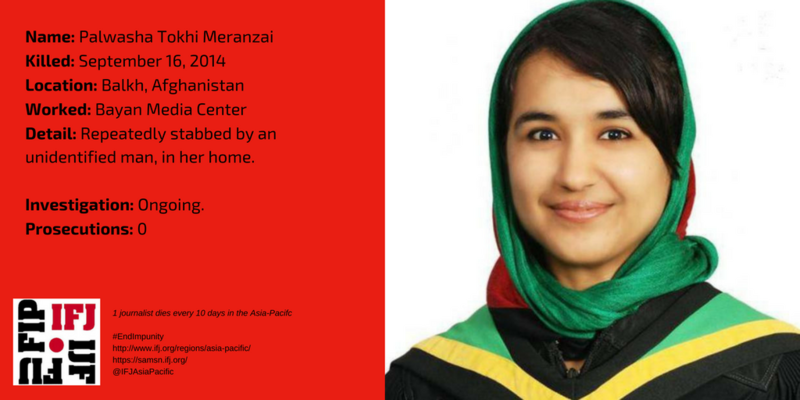 What is the UN Plan of Action on the Safety of Journalists and the Issue of Impunity? 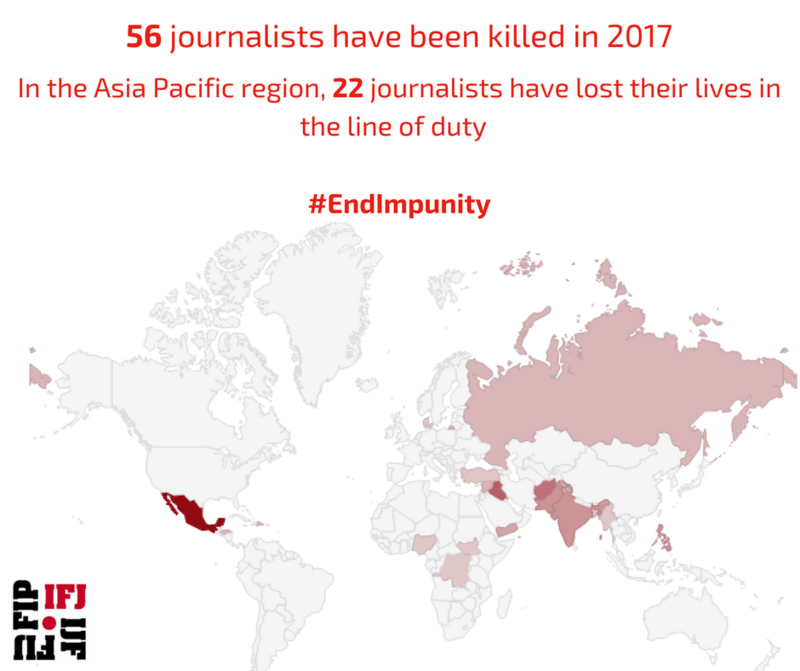 According to IFJ statistics, 56 journalists have lost their lives while carrying out their duties since the beginning of the year. Today only one out of 10 killings of journalists is investigated. The situation for non-fatal attacks on journalists is even worse. Governments fail in their duty to hunt down the harassers, the attackers, the killers of media workers. Impunity not only endangers journalists, it imperils democracy and compromises hopes for peace and development. Legal guarantees exist for the protection of journalists as civilians which states are duty bound to enforce under domestic and international law (read more below). While we are targeting all governments and de facto governments that have failed to investigate those crimes we are putting a specific emphasis on seven countries: Afghanistan, Pakistan, Mexico, Iraq, Yemen, Somalia and Ukraine. 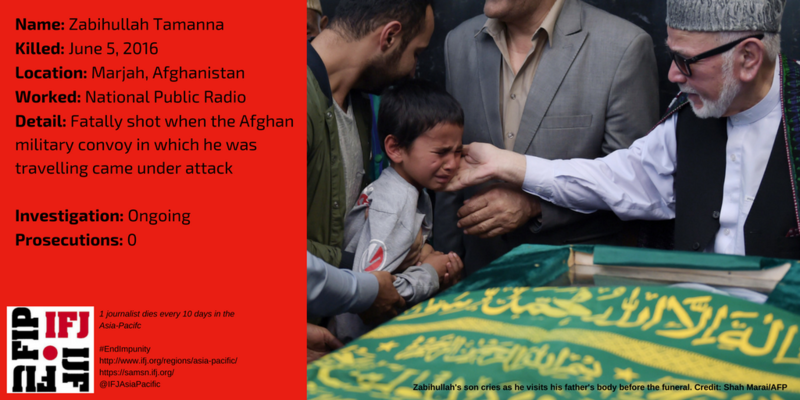 The high level of impunity in Afghanistan causes an increasing number of threats and violence against journalists. 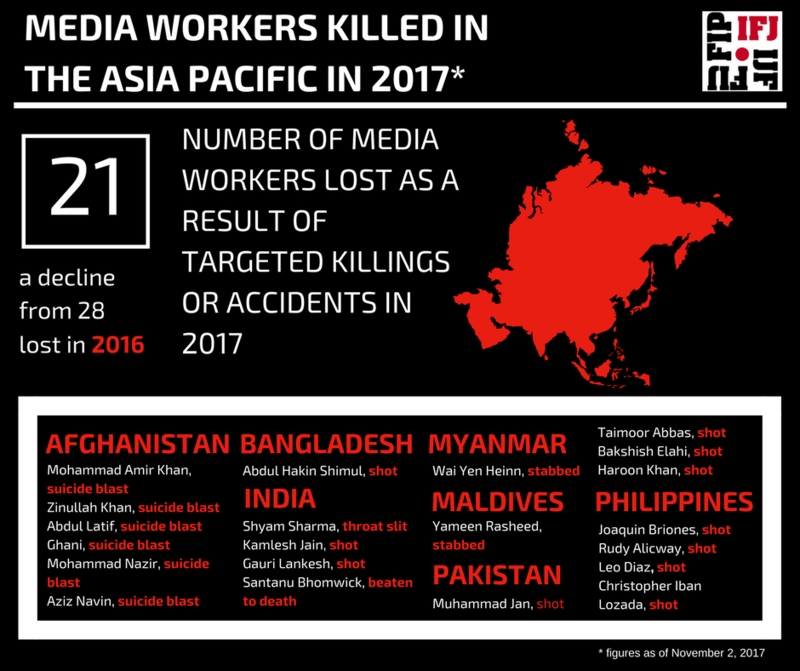 The IFJ registered 48 journalists killed in the last ten years, including six deaths in 2017. The harassment of media workers comes from authorities and government officials. There is no prosecution of those who assault journalists for their critical reporting. The threats and insults from the police officers in provinces endangers trust in a fair and independent investigation as well as discouraging journalists from reporting violations against them. 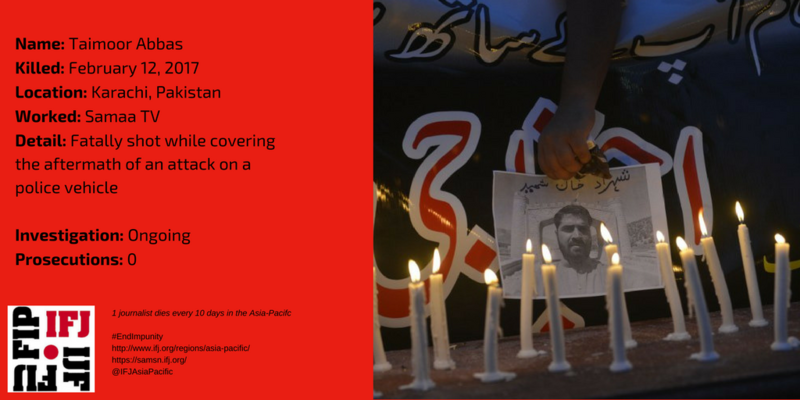 Pakistan has long been among the most dangerous countries in the world for journalists, with 94 journalists and media workers having lost their lives since 2007. This represents almost one journalist killed every month. The armed insurgency and sectarian violence account for a number of these killings but many of them raise suspicions of the involvement of the state’s institutions. - Download the campaign poster here to use it during the campaign in your electronic signature, on your twitter account, your facebook page or your website. Encourage all your members and their friends to download it, take pictures holding it and share them on Facebook, post them on Twitter with a brief message to the President or Prime Minister of your country urging them to take a public stand against impunity for crimes targeting journalists. 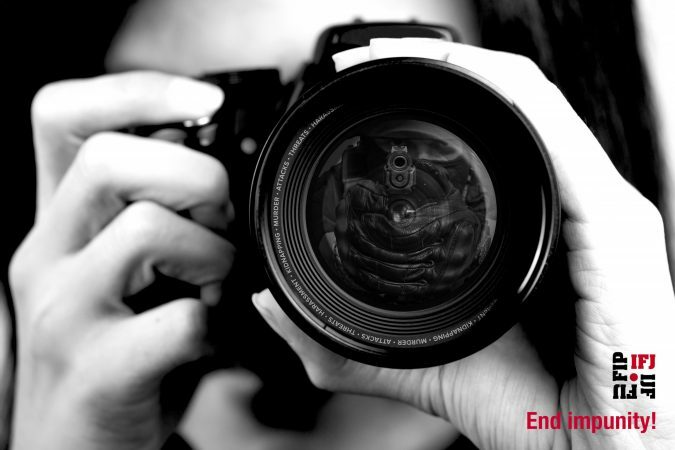 Use #endimpunity hashtag. - Send letters to your own government or to the government of targeted countries holding them accountable for their impunity records. Organise a visit to their embassies in your country to deliver the letter, take photographs and disseminate them widely using #endimpunity. Click here for more graphics.